I had enough of the fake covers on ebay. One of the active sellers has ebay id ��cashstamp888��. This person has been selling modified Red Revenue and Covers. He is a stamp dealer in Ho Mon Kok Shopping Center. Room 207, Kowloon Monkok. His mobile number is +852 602 85839. His name is Ka Wai Luk. Here is his most recent creation. The recently surfaced covers are almost all using a genuine cover, that originally with a cheap issue, like a coil dragon stamp. Then a red revenue and/or dowager stamp(s) were added to replace the coiling dragon stamp, and a forged cancellation was applied on the added stamps. Almost all these forged covers have multiple franking, and mostly including a red revenue stamp to enhance the value. 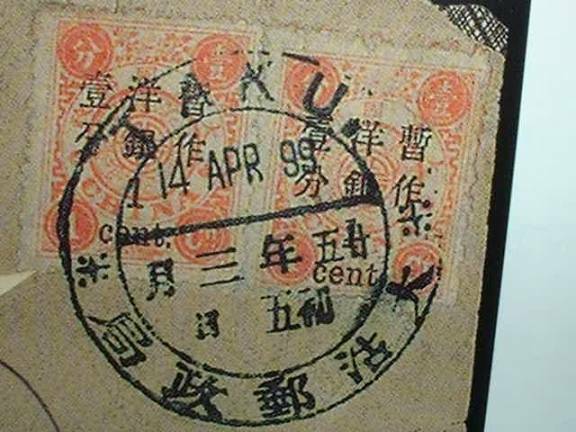 The multiple franking might also be needed to cover up the original cancellations after the coiling dragon stamp was removed. The picture above is one such example, and sold in eBay recently for $4450. A close examine indicates the Dowager stamps are heavily toned, while the red revenue stamp and the cover are well kept, without any sign of toned color. This indicates the dowager stamps were probably united with the cover and the red revenue stamps recently, rather than when it was mailed in 1898. Furthermore, the red revenue stamps and Dowager overprint issues are largely replaced by coil dragon stamps in 1898, and the 10c stamps are readily available. Such multiple franking are usually added by a stamp collector rather than a post office clerk. Such philatelic usage by stamp collectors are well documented over the years, because these covers would eventually being sold, traded, or exhibited during in the first half of the nineteen century, such as the Macus covers. A newly discovery of one such philatelic cover after 100 years is usually, not to mention the Taku dollar dater was not recorded on a red revenue stamp, let alone a cover. A research on the known genuine Taku dollar dater indicates all usage before and after August 1898 was in very dark blue color, and never recorded in such light blue color. In addition, unlike large and busy post office like Shanghai, which use more than one chop, Taku is a small post office and presumably only one chop was used during this short usage between August 1898 and July 1899. Although the Taku cancel on the cover match well with other known genuine usage, the star at the left did not match the pattern from genuine usage (see below). 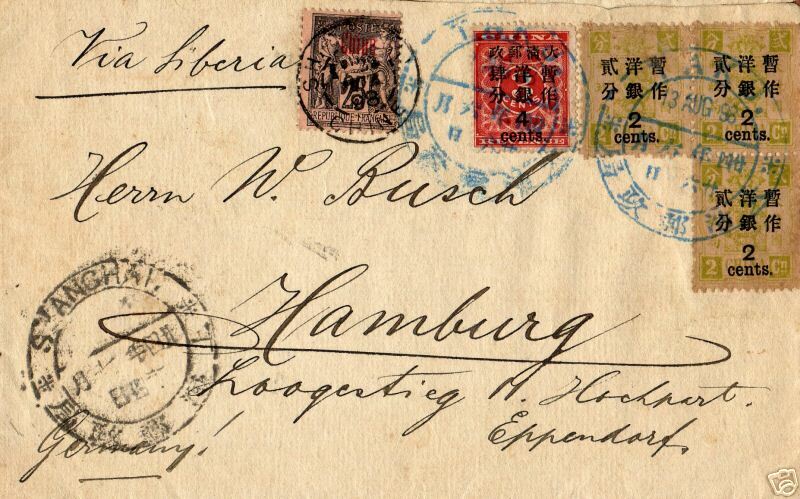 Finally, for a 1898 combination cover to Germany, the lack of any transit mark in top picture, except the Shanghai dollar dater is also very suspicious. When serious about investment on the red revenue and/or dowager covers, I would buy from reputed firms that have extensive knowledge and expertise. Use of an expertization service, including the service offered by China Stamp Society. It cost little compare to the value of the cover. And it not only protect your investment on these covers, but also will enhance the value of your cover over time. Invest a few hundred dollars on reference books. It not only increases your knowledge, but also with a lot of fun. Use common sense. When a $5000 Rolex was sold for $500, the chances are, the Rolex is probably no good. Same for these Red revenue/Dowager covers. Even for the above ��Taku�� red revenue cover. Although it was sold for $4450, a genuine cover, if exist, would probably fetch $30000 to $40000 in Hong Kong, as Taku dollar dater are yet to be found on a red revenue stamp, let alone a cover. There are estimated only about 200 to 300 red revenue covers exist, and much of it are single usage from known correspondence. A good portion of it were already recorded in the red revenue book, and mostly are in well known collections. There are probably less than 20 genuine pre 1900 red revenue and dowager mix frank cover exist. The odds for such a genuine cover offered in eBay at $1, and with different ones offered every month, is probably just too good to be true.